Bridge of Spies is the fourth Steven Spielberg movie to star Tom Hanks. It looked very serious (just look at Hanks' stare on that poster! ), but I could get free tickets to a preview screening, so why not give it a chance? I like Spielberg and Hanks. I'm glad I took that chance because I loved this movie. It isn't dour at all. It's very funny - sometimes a dry humor and sometimes laugh-out-loud hilarious. It's also based on an incredible story that doesn't need explosions and chase scenes to keep things tense. 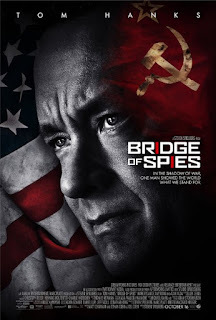 It's the heart of the Cold War, and James Donovan (Hanks) is selected by his firm to represent Colonel Rudolf Abel (Mark Rylance), a Soviet spy who has been caught. His guilt isn't in question, but he still has to be given a fair trial. Donovan takes the job because he believes in the Constitution, but soon finds himself admiring Abel, who is honoring what his country has asked of him. Things look grim for the most hated man in America - that is, until U2 pilot Gary Powers (Austin Stowell) is shot down over the USSR. I'd heard of Gary Powers before, but knew nothing about the story of how two spies had been exchanged between the countries just as the Berlin Wall went up. Hanks delivers a predictably good performance as a supremely competent man driven by a narrow but intense sense of ethics. He plays wonderfully off of Rylance, who gives a rather taciturn performance that manages to hint at deeper feeling below the surface. Many of the other actors are also impressive, although Austin Stowell and Will Rogers (as another American in trouble) give little more impression than that of a handsome block of wood. Bridge of Spies is not a dry, stuffy story at all. The clash of the US, USSR, and East German governments is Brazil-esque in its labyrinthine bureaucracy. It's a delight to see someone cut through that and manage to get the right thing accomplished. Bridge of Spies opens October 15th. I recommend ignoring the boring poster and giving this one a chance.